We are in a race between tipping points in natural and political systems. Which will come first? Can we mobilize the political will to phase out coal-fired power plants before the melting of the Greenland ice sheet becomes irreversible? Can we halt deforestation in the Amazon basin before the forest becomes vulnerable to fire and is destroyed? Can we cut carbon emissions fast enough to save the Himalayan glaciers that feed the major rivers of Asia? Can we win this race? 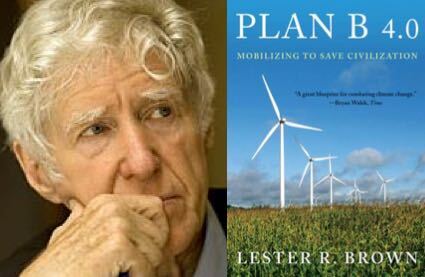 In his book, PLAN B 4.0: MOBILIZING TO SAVE CIVILIZATION, BROWN lays out the symptoms, the diagnosis, and the cure. He estimates that we could solve all the world’s greatest problems for $200B a year – less than half the US defense budget. PLAN B 4.0 is a comprehensive plan for reversing the trends that are undermining our future. Its four overriding goals are to stabilize climate, stabilize population, eradicate poverty, and restore the earth’s damaged ecosystems. Failure to reach any one of these goals will likely mean failure to reach the others as well.It’s time for Plan B: an all-out response at wartime speed proportionate to the magnitude of the threats facing civilization.